Caramel isn't really my thing. I like caramel sauce, especially homemade, but I don't like chewy caramel candies. For some reason, it's just not my thing. But then again, neither is wearing high heals, exercising, or listening to Kesha. Even though these are not Yammie-ish things and I might even hate them (especially Kesha), I still do them. No one knows why. It's the same way with caramels. But I do hear that most people like caramels. So, if you are one of those people, I think you will appreciate these cookies. 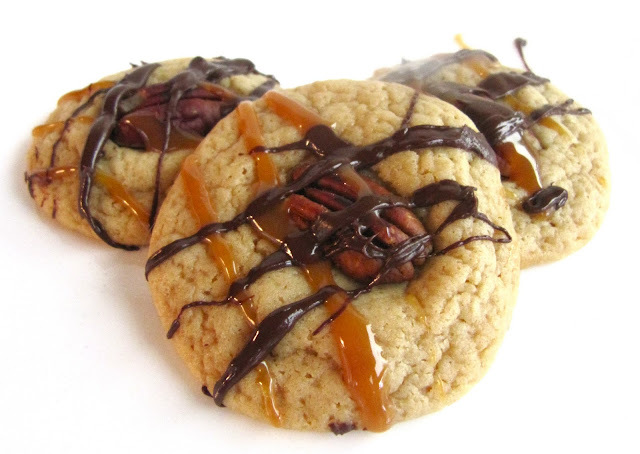 It's a caramel cookie with a Rolo baked in and a pecan pressed into the top with more caramel and chocolate drizzled on top. I'm not gonna lie. I ate my fair share of these babies. Maybe more than a fair share. Cream together the butter and sugar until fluffy. Add the caramel, vanilla, and eggs and beat until well combined. In a separate bowl, mix together the flour, baking powder, baking soda, and salt. Gradually add into the butter and caramel mixture and beat until combined. Scoop out by tablespoons. Press a Rolo into each cookie and then roll it into a ball so that the Rolo is on the inside. Bake for about 7-10 minutes. Then lightly press a pecan into each one and drizzle with the rest of the caramel and melted chocolate. (I should have just cooked the pecans right in with the cookies. I don't know why I didn't. But you should at least lightly toast your nuts on the stove or in the oven before using them. It makes them yummier).